Visit the original site of the Stax Records studio in Memphis, Tennessee, the Stax Museum. See this museum’s special tribute to the artists who recorded there, as well as other American soul legends. Discover the museum’s rare and amazing collection of more than 2,000 artifacts, interactive exhibits, films, and galleries. Begin your visit with a compelling 20-minute introduction to the Soulsville Foundation (which operates the museum) and a brief history of Stax Records. After the film, enter into the self-guided portion of the museum. 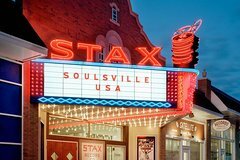 Enjoy its focus on Stax Artists, including: Isaac Hayes, Otis Redding, Sam and Dave, the Staple Singers, Rufus Thomas, and more. Stop by the Soul-Train dance floor, an exact replica of the original Studio A, as well as Isaac Hayes' Peacock Blue, 24-carat gold-plated, Cadillac Eldorado. Watch a film and explore the listening stations, where visitors are able to select specific songs recorded at the very location of the museum. Guests are able to spend as much time as they like. The Museum is located approximately three miles from downtown Memphis, making it about a 10 minute drive or cab ride. Take advantage of the free and ample parking on the campus, which is also home to the Stax Music Academy and the Soulsville Charter School.